In modern times, we have not seen anyone in politics like Donald Trump. As I wrote previously in this column, the Trump Paradox is this: Mr. Trump needs the cooperation of people who don’t like his brand to move his agenda forward. It is no secret that his brand is struggling to increase significantly beyond those that elected him; yet he needs increased market share to put pressure on Washington, D.C. for Congressional support for tax reform and healthcare reform. Events, however, unintentional or otherwise, continue to pop up that make expanding the Trump Brand a challenge. Meanwhile, his intermittent management missteps are hyped by his critics, while his successes are rarely mentioned by the fourth estate. It’s why the branding and marketing model may be the only viable paradigm today to explain his robustness to his core supporters.It is also why the “modern-day presidential” model has become Trump’s effort to redefine the presidential brand as we know it. Again, the Trump paradox is in play, which is: How do you drain the Washington swamp when the very people you want to change, the media and the political establishment, are being criticized by Trump’s provocative ideas? Those ideas are alien to them but resonate with most folks outside of the NY, DC, and West Coast precincts. 1. Play to His Strength: Build, Build, Build. Build that wall; build new roads; build new infrastructure. From a brand perspective, the name Trump means builder. One could argue that this should have been his first agenda item. It still can be a priority if he wants and a way to get both sides to the table. This could create goodwill to all concerned. Trump should think of it as “building bridges” for all legislation to a very disparate congress. It’s simple: Think BUILDER! 2. Continue The Art of The Deal: Make deals whether with Republicans or Democrats. Another Trump brand characteristic is the “deal maker.” His successful best seller The Art of the Deal should be the primer for getting things accomplished in Washington combined with Reagan’s understanding that someone who agrees with me 80% of the time is largely my friend not an enemy. Infrastructure and tax legislation could create much needed “good will” for those facing competitive House races and Democrats and Republicans who need an Obamacare fix before the 2018 elections. Common ground translates into common interests: legislation that satisfies voter needs for both sides of the political aisle. More and more of those meetings, just as Ronald Reagan did with Tip O’Neil, can only help in the “sausage making” component to getting legislation passed, no matter how off-putting it is to the doctrinaire ideologue. Trump would do well, once and awhile, to mix in Reagan’s use of humor when criticizing his foes. It’s simple: We do business with those we like doing business with. The President and his advisors would do well to remind themselves of the importance of that basic human need. Beyond that, those meetings confound the American Media and blunt their attacks on Trump. The pictures from those meetings not only are worth a thousand words, they soothe hundreds of thousands of voters. 4. Focus on The Economy. Make people’s lives financially better than they were four years ago. Economic growth rate up again to 3.1% in the second quarter is only good news for President Trump. “It’s the economy, stupid” is the dictum that has never been truer in predicting a president’s success—that not only plays to Trump’s businessman brand, but it’s the attribute that will resonate with many despite party affiliation. Those who experience TDS (Trump derangement syndrome) will never be convinced, which is why one must remember the axiom: You can’t sell meat to vegans. To stay on point, Trump and his team must remember the words of the great Johnny Mercer when he wrote: “accentuate the positive, eliminate the negative, latch on to the affirmative, don’t mess with Mister In-Between. 5. Get something done, please. “Nothing succeeds like success,” said the French dramatist Alexandre Dumas. That’s why this is so very important to the Trump brand. Yes, the Justice Gorsuch appointment was a great victory; however, as they say in politics, it’s not what have you done, it’s what have you done for me lately. Trump needs a legislative victory. Presently, he is banking on tax reform and tax cuts. And the games are just beginning. 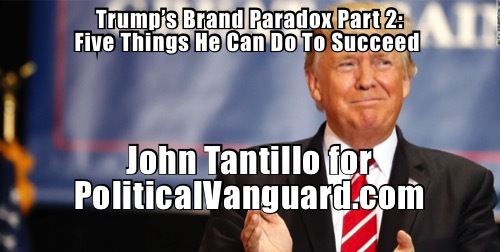 Now, as never before, the Trump brand skills of the business professional deal maker and charmer can be brought together to score a timely victory for Brand Trump, so that winning becomes part of the Trump lexicon. In the final analysis, The Trump Paradox, criticizing the people you need to engage in making changes, is possible as long as he remembers his brand and implements these ideas with marketing in mind.